Run Gainesville | A runner's guide to Gainesville, Fla.
A runner's guide to Gainesville, Fla.
Hello Run Gainesville friends. Yes, it’s been a long time coming, but I have made my triumphant return to Gainesville. The good news is I am here, employed, and still running. The bad news, I suppose, is that I haven’t updated this site in 5 years. Well, then, I guess there’s no longer any bad news. Stay tuned for more running and miscellaneous-topic posts from yours truly. There’s much more Gainesville running magic to discover! Run Gainesville is not dead. Ho! Far from it. Rather, like a cuddly brown bear, Run Gainesville is in hibernation. Run Gainesville, like brown bear, hibernates for months at a time. You see, I am no longer living in Gainesville. Yes, it’s a cold and sad fact. I have moved back home to my beloved 305, and although I still and will forever love the 352, it is a challenge to write about the G-Love’s events, news and such, from 400 some-odd miles away. So for the time being, head on over to Run Miami, where I am still good for a few cheap laughs per month and, oh yeah, running thoughts, advice, info and more, too. If you were paying attention to Olympic coverage this weekend, you no doubt saw Usain Bolt sprint to 100m gold in 9.63 seconds, which, if you’ll indulge me, is about how long it will take you to read this sentence. You certainly saw 16-year-old Gabby Douglas (who, I must add, was born on the date of the all-time greatest Phish show — sorry, had to!) win the women’s individual all-around gold in gymnastics. You probably saw Kerry Walsh and Misty May, Kobe Bryant and LeBron James, Missy Frankling and Michael Phelps. And you almost certainly did not see one of the most triumphant, far-fetched, “zany, unbelievable, absolutely impossible dream” of a United States medal, won by a skinny and tall homely white boy from Oregon: Galen Rupp. Munich ’72? One more guess. 1964. When the Summer Games were held in a little-known town called Tokyo, 48 years ago. (Want to check the lists? 5000m and 10,000m). The gold medalist that year? The ultra high profile, world famous, American celebrity and legend Billy Mills. Wait, what, you’ve don’t know who that is? You’ve never heard of Billy Mills? You say no one even so much as mentioned his long-ago medal at any time in Olympic coverage leading up to the 10K race? Oh, that’s right..
BECAUSE THE UNITED STATES HASN’T BEEN RELEVANT AT LONG-DISTANCE TRACK & FIELD EVENTS IN 50 &^%$*@# YEARS. Galen Rupp has defibrillated US Olympic Track & Field, for five decades a mere fly on world track & field’s morning newspaper. And how many of you watched the race as it happened? How many of you read the post-race coverage on the front page of ESPN.com (LOL)? How many of you knew that this even happened until now? I know that reads like I’m pointing a disapproving finger. Like I’m shaking my head slowly and sighing audibly. And I am. Not at the American public, patriots, athletes, runners, sitters, standers. I’m disappointed.. no, I’m not.. I’m $#@%$*& PISSED that the American media, even the sports media, hasn’t given this 1/1,000th the coverage they’ve doled to Usain Bolt. And I’ll remind you, although I don’t need to, that he’s from Jamaica. You know, NOT THE UNITED STATES. Maybe it’s an indictment on our ever-shortening attention spans that the American public, and thus the American media, would rather watch 9.63 seconds of glory for another nation than 27 minutes and 30 seconds, 48 years and 12 Olympic Games worth of pressure on the shoulders – and legs – of one man, all 138 pounds of him. But I blame the American media and American sports journalists for not recognizing and publicizing the greatness, the triumph and the glory of Galen’s moment under the fog on Saturday. Shame, shame, shame on you. Galen Rupp, Olympic 10K silver medalist, American Hero. RunGainesville’s 2nd Summer – We’re Celebrating, Y’all! Yuuuuuup. Just realized it myself; R to the UN, G to the VILLE is T-Minus one day until its second official summer in existence. The scary thing is it’s not even summer yet, officially, but it’s been summer weather for about a month now. If there were a Groundhog Day in Florida, say, with a flamingo, and predicting summers, well, … well, crap, I don’t know what it’d see. Not important anyway – move along. I have been celebrating my second summer of RunGainesville operation since May 15, when I picked up my first planner aka. running log from Target. I’ve never been one for meticulously planning out runs, weekly mileages or regular routines for myself. And as a generally unorganized guy (in the traditional sense! 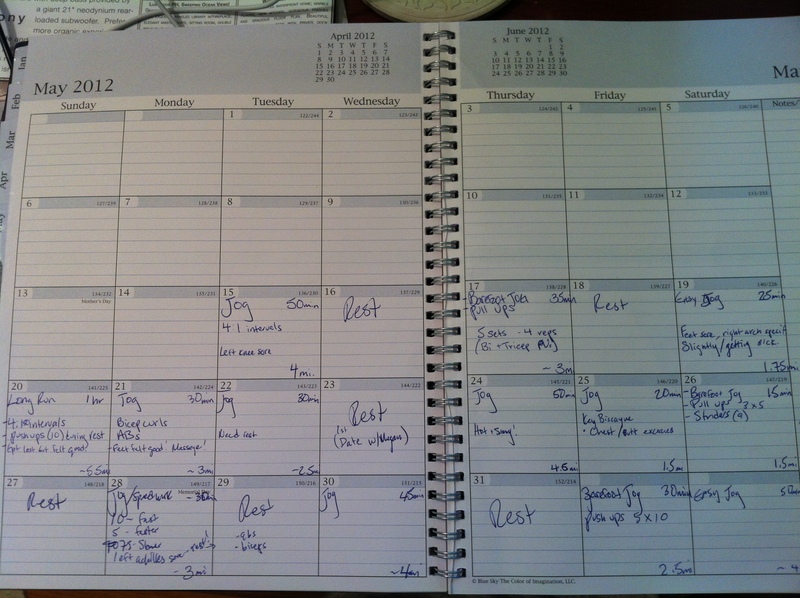 ), keeping a running log has been a big step for me. Let me show you how I keep my log, and then I’ll say a little bit about why it’s so helpful. Well for whatever reason, the picture of June 2012 won’t upload, tyvm WordPress, but it doesn’t matter anway. As you can see I list what kind of workout I’ve done, time of run, distance and any relevant notes about the workout, pace, my health etc. If you’re really meticulous, you can keep track of a myriad of stats about your runs: terrain, weather, fluid/food intake, time of day etc. There’s really no limit. I find the log especially helpful in determining when I should rest and when I should push it. It’s also an incredible tool for looking at long-term vs. short-term progress aka. macrocycles, mesocycles and microcycles. And let’s face it, it’s just nice to be able to see how much work you’re putting in. It can make me feel pretty good about myself. Another nice thing about running logs is you can find one at Target or Walmart for very cheap, or you can simply make do with what you have around the house. An old composition book would work well for a running log. What do you use for a running log? Have you found it’s helped you along your running journey? Care to share a picture of your log or a related experience? Please do! The word has been ping-ponging in my head for a few months now. As a runner, does that mean something to you? Do you focus on restraint? Do you harness it? How much do you even have? As I started running more and more miles, from my half-mile breathless romps around northwest Gainesville to 8-mile long runs in heat or downpour and sometimes both, the word restraint began to force itself upon me, as if actively taking on a new meaning. As a new runner, I ignored restraint and it ignored me. Where is the restraint in running until your lungs sear, your legs ache and your head spins. And this in 10, maybe 15 minutes. Even a mile run? Is there restraint in taking a day off when wild horses couldn’t drag you out for a run? I couldn’t find any. Less so crossing a self-imagined self-imposed finish line on my first three-mile run; give it all you’ve got – 110% of your energy, joy, willpower. Let it all out. Get across that line. Maybe there’s no singular moment. I can’t remember mine. But “when” and “how” become lasting. Everlasting, I hope. “When” and “how” lead you to the doorsteps of… you guessed it. Excitement. Restraint. Sprinting. Restraint. Two-a-days. Restraint. 5 miles, 10 miles, 20 miles, marathon, ultramarathon, 100-miler. Restraint, you mother fucker. And a blessing or a curse? Is restraint keeping my achilles attached, or is it keeping me from Olympic trials? Is restraint keeping my mind sharp, focused, energized and burnout-proof, or is it unnecessarily gnawing at me, weakening me from the inside? Questions to ponder, yes. To answer? I don’t know. I’m not sure I ever will. I believe it a powerful tool. I trust it will serve me well, but I can’t be sure, and only time will tell. You know, the everyday, the mundane, the rote. So, with limited grandeur and modest expectations I bring to you: Random Running Thoughts a.k.a. Sh*t I’ve Been Thinking About The Last Week. Start (0:00): I start running… slooowly. I run slowly so that I will make it the entire 1:40, and to try to avoid any (seemingly randomly occurring) foot pains. 30:00 : I am still running, but I have realized that the park that I’m exploring is smaller than I expected. I am already mildly bored. Not good. 60:00 : I decide to run to another nearby park, which is about a half mile run through Miami traffic. Like, Bird Road traffic. Just awful. I am not sure that I should even bother checking out this other park, but I do. Boredom increasing, legs feeling heavy. 75:00 : Grab water at park #2. The sky has grown dark, and it begins to rain heavily. I try to look at this as a positive, but I am too exhausted. Begin return to original park. 90:00 : Back at original park, but I still have 10 minutes to run. Knees hurt, legs heavy. Can I stop now? Finish: Check Mapmyrun and find that I’ve broken my PR distance by more than a mile. It is now raining, windy and cold. I am too uncomfortable to get in a true warm down. Looking at the run in black and white, it was pretty successful. I met my time goal, 1:40, I ran further than I ever have before, and I wasn’t injured. But, truth be told, I didn’t enjoy myself on the run. During, I was bored. Afterward I felt rundown and burnt out. Marathon? No thanks. Random Running Thought #2: I ran with an iPod strapped to my arm for the first time during that long run. The tunes were great. The band holding my iPod was cumbersome and unsnug, though it did its job. Random Running Thought #3: MapMyRun is both a blessing and a curse. Yes, it is very awesome that one can track the exact distance and time of any run/bike/hike etc. But now, I run around the block and I want to know how far, what pace etc. And that damn armband..
Random Running Thought #4: The backs of my knees get very sore on long runs. I should ice them afterward. I had to take a break from running after that long run. My body and mind needed a significant rest. I was burnt out. I took about a week off, save one short run, and I’ve been easing my way back into the previous routine (~25-30 miles a week). Can’t stop. Won’t stop. Since January, I’ve visited Israel, driven through and/or stayed in every state between Florida and New York – twice – spent five days in New Orleans and a weekend back in Gainesville. All that in between working, running and, oh yeah, trying to figure out what to do for the rest of my life and where to do it. All this has left RunGainesville on the priority back-burner for a little while. And while I think it’s been beneficial to take a break from the blog and writing in general for a little while, I’m ready to get back into it. So, here I am. Here we are. Cozy, isn’t it? Fortunately, and quite purposely, I might add, my running routine has not suffered, my weightlifting has picked up a bit and I feel strong like bull. I’ve been working on some running ideas lately and pondering/experimenting with some strength-building ideas I’d like to share with you. Let’s first talk running. I’ve picked up some new ideas and good advice from well-known runner and friend of the blog (in my mind, anyway) Jeff Galloway and his book: Galloway’s Book on Running. Aim for 30 minutes or more of cardiovascular activity: Before 30 minutes of cardio, your body is using carbohydrates as a majority of its fuel. At 30 minutes, the fuel is 50% carbs and 50% free fats, and after 30 minutes you’re using more fats than carbs for fuel. You’ve heard it before, but 30+ minutes of cardio 3+ times a week also strengthens your heart, lungs, circulatory systems, reduces the risk of relating cancers etc. etc. Of course this doesn’t have to be only running. Back in Gainesville I used to like to run around campus and when I got tired, I’d go to the gym and hop on the bike for another 15 or 20 minutes of easier cardio. Lifting weights can be quick and dirty: You don’t need to be lifting for 45 minutes to see results, nor do you need to work 4 muscle groups each time you lift. Not unless you’re trying to bodybuild, which you and I as runners are most likely not. What you do need to do is warm up, use proper form and be focused on what you’re trying to accomplish for that day. On most lifting days, I like to hit 1 or 2 muscle groups, and I like to lift heavy. That means I’m usually doing no more than 10 reps of any exercise, and usually somewhere between 5 and 8 reps. Vary your exercised and your reps to “confuse” your muscles and promote growth. Google is a gem resource for exercises and lifting information. Push ups and pull ups are quick, convenient and as easy or taxing as you’d like them to be: Confession – I used to hate push ups and pull ups because they were/are hard, physically and mentally. One cool thing about them, though, is that they should get easier pretty quickly for you if you’re trying to improve. If you can’t do a regular push up, try doing it on your knees rather than your toes. If you can’t do a regular pull up, jump up and try to hang for 5, 10 seconds or as long as you can. Doing this a couple times a week will get you better at these exercises while making you stronger and more “cut.” Furthermore, there are an endless number of variations of push and pull ups that work different muscles. Variations keep you from getting bored and keep your muscles growing at a premium. Mix in some weights and/or strength-building exercises with your runs: This can be tough physically and mentally, but honestly, you’ll feel like a badass after this kind of a workout. You’d be surprised how easy running feels after a set of pull or push ups. As promised, a few things that I’ve been working on the last couple of months. Keep running, keep lifting, keep eating well, and the world is yours. Thank you, University of Florida, but I’m out! As of December 16, I will officially be an alum of the University of Florida. I’ve called Gainesville my home since fall 2009, and this time has been as important a two-and-a-half-year period as any in my life. There’s just something special about Gainesville. I think a lot of us are missing it. In 8th grade my family and I took a trip to Gainesville for a law school function (dad). I remember shopping for Gators gear in Midtown, going to the football game on Saturday (a 60-something to 0 blowout) and, very hazily, having dinner downtown. It’s disappointing to realize that many UF students will leave Gainesville with only similar memories. There’s so much more to this town than what’s happening on University Avenue. I don’t like to be sappy, but I’d like to post a couple of non-University Ave. memories I’ll be taking away from the ‘Ville. The summer I spent running up and down 62nd Boulevard. I think I ran a half mile the first day, if that, and was completely exhausted. In fact, I may remember the exhaustion from these first runs more than anything else about them. Nighttime full-moon trips to San Felasco. When the moon is really shining, the fields at SF are lit like daylight, which makes for great running as well as alone time. I also remember laying on the haystacks, watching meteors, with beautiful green tails, streak the sky. Adam’s Rib Co. for evoking my love of barbecue and Satchel’s Pizza for so many reasons. I wrote a handful of stories about Satchel’s for school – I don’t think there are many places like this, or people like Satchel, anywhere. I’ll also remember drinking Bud or Bud Light, the only two choices, out of mason jars at the Ole Barn across the street from Satchel’s. Local springs, and not just Ginnie. Silver, Rainbow, Blue, Ichetucknee, De Leon. Each one is amazing in its own right. I could go on and on, but I think I’ll spare you. If you only take away one thing from the previous howevermany paragraphs, remember that to truly appreciate Gainesville, you need to get away from the large rectangular area that is UF and explore the surrounding areas. The other development in my life is that I’m injured, pretty much my first as a runner. The culprit is my left Achilles tendon, which I think I injured running on a cold night without enough warmup. I didn’t feel it get injured, but the next day I was experiencing burning at the back of my heel with every step. It’s been about a week now, and the pain seems to be, for the most part, gone, but I’m going to be very cautious and give it another couple of days before I begin running again. I’ll be sure to let you know how that first run goes. Welcome to the first installment of Marathon Memories, a series that will highlight the marathon experiences of a number of Gainesville’s runners. My hope is that the marathon stories of Gainesville’s runners will inspire others in this area, and all across the country, to run, race and, above all, challenge themselves. 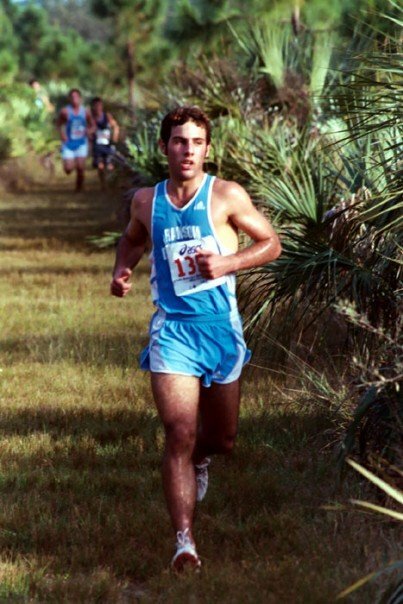 The series’ first subject is Anthony Traina, a 25-year-old University of Florida alum, longtime runner and 8-year resident of Gainesville. I have known Anthony for many years, as we first met as trumpeters in our sixth grade symphonic band. Back then Anthony was something of a middle school athletic hero, winning award after award and setting school records for running. To my 11-year-old eyes, it seemed like Anthony was bound for the Olympics. And although that didn’t happen, I can with pure certainty say that I never met anyone else, throughout middle and high school, as in love with and intensely dedicated to the sport of running as Anthony. Last week I sat down with my old friend in downtown Miami, just removed from the race path of the Miami Marathon, his one and only marathon experience. We chatted about his running background, his marathon experience and his thoughts, in general, on the marathon as an event. *Thanks to Anthony for sitting down and talking with me, and a special thanks to Jake Diamond for filming the interview. Running Through the Holidays – Don’t Fall! It seems as though just about everyone struggles to maintain a workout regimen throughout the holidays, myself included. It’s OK if you’ve fallen behind or are temporarily derailed altogether from your running, lifting, swimming etc.! If you’re saying to yourself: wait, it is OK? Read on. If you haven’t missed a beat at all throughout the holidays, I want to hear how you do it! Here’s my opinion on the matter – the reason why I implore you not to stress about falling, temporarily, off the fitness wagon. Fitness, be it running, jumping, fishing or fighting (thanks, Mick! ), is a lifelong practice. To be cliche, it’s a way of life. There simply is no rush to get fit. So if you haven’t ran in a week, two weeks, a month, don’t fret. Don’t think about how long you’ve been inactive, busy or just plain lazy. Because tomorrow you can get outside or get on the treadmill, be active, push yourself and feel great about it. The wagon is always there for you to get back on. Enter your email address to subscribe to Run Gainesville and receive notifications of new posts by email.